Convert Your Notebook Into A Large Screen Navigation System! 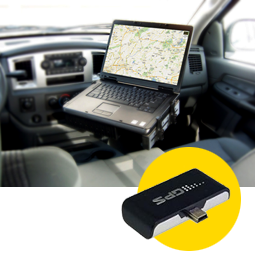 You can now effectively use the Ectaco GPS attachment with your Ultrabook, Notebook or Netbook! Once plugged in to your notebook via USB, the tiny GPS receiver quickly and smoothly locates your physical position in real-time on a moving Google Map. Please write the full name and model of your Ectaco device in the comments field. We need this information to make sure you receive the proper accessory that's compatible with your unit. Storage Pouch - Protect your SpeechGuard with this extremely light-weight and portable case. Ectaco Car Charger - Recharge your SpeechGuard in your vehicle. LCD Protecting Film - Keep your SpeechGuard looking new with this protective film for your LCD screen. Prevents scratches that come with frequent use: contact with keys, coins, sunglasses, etc. SpeechGuard Holder- Mount your SpeechGuard unit to the windshield of your vehicle. No other solution provides as much diversity for mounting. Converter Kit- Outlet adapters for travel in Europe. AC/DC adapters allow you to save batteries while working with Language Teacher and Partner. Only the 110V model is available now. Featuring a travel kit that lets you use and charge your P800 device all around the world, an MMC card reader to facilitate data exchange between your device and your computer, a car charger that can be easily connected to the accessory plug of your car or boat in order to recharge the P800 translator and JD-600E Headset with Mic to operate hands free in most environments, this accessory pack is just the thing to extend and enhance your device. The power converter will allow you to use 110 V AC/DC adapter in Europe and other countries with 220V electric power. Interactive course of American English - "Let�s talk American"
Marked by simplicity and clarity, this course has become an all-time favorite for thousands of learners in Russia and across the Atlantic. The specially developed logical system of language learning will allow you to get a good command of English very effectively and in a short period of time. This new course�s name is no accident. The learning technique specifically addresses the issue of active conversational training and will help you to develop the patterns of practical oral communication. This course is designed for those who live in America or those intending to visit it or settle there � all included dialogues, terminology, everyday speech, colloquial expressions will get you acquainted with basic American life realities and therefore will help you to communicate effectively. The course is designed for the native speakers of Russian, and is divided into several chapters of practical development of conversational skill, and includes grammar, phonetics, wealth of dialogues and practice exercises. The material is presented in a logical way, allowing the students to progress and learn as they go at their own pace, introducing the conversational topics, grammatical constructions and necessary phonetic reference in a well-structured, clear and concise manner. The interactive course is complete with manual in .pdf format. PC-Link cable for high-speed data communication between your Language teacher and your computer. The package can be used with 486, 750, 760, 780, 200, 600 models. This package consists of the following items: a special cable for high-speed data communications between your Partner� 586HT and your computer; a cable for sending faxes and e-mails; unique software. a PC-link cable for connecting your Partner� X5 or Partner� X8 to a computer. This rechargeable 3.7 V, 1400 mAh Lithium-Polymer Battery is just the thing to keep your P800 series device up and running. Use it as a supplementary power source and you will always be ready to go. For use in all P800 series devices. This rechargeable 3.7 V, 1400 mAh Lithium-Polymer Battery is just the thing to keep your P850 series device up and running. Use it as a supplementary power source and you will always be ready to go. For use in all P850 series devices. This rechargeable 3.7 V, 1700 mAh Lithium-Polymer Battery is just the thing to keep your P900 series device up and running. Use it as a supplementary power source and you will always be ready to go. For use in all P900 series devices. Personalize your Partner 900 device with an exclusive engraved message only from ECTACO! Make an already superb gift one that will never be forgotten or make it uniquely yours. All you need to do is add a personal message like a name, a favorite quotation or song title, a birthday or other special occasion greeting and you have the prefect gift that will always be remembered! Simply enter the text you would like engraved in the Comments field on your order form and tell us if you want it in the top-left corner or centered. For example: "I would like a black one. The engraving should be: Richard Miles, Evansville Kentucky USA. 555-657-6352"
PLEASE NOTE: While an engraved Partner P900 device is still covered by the full 1-year warranty, returns can not be accepted. The extra durable, 3.7 V, 1800 mAh Lithium-Polymer Battery will duly power your iTRAVL. No need to risk staying "off guard" and helplessly struggling without an interpreter. Stay one step ahead, get yourself an extra battery! DC-DC6 for SG, 400 and 800 series. You are free to charge ahead when your ECTACO model is re-energized via this 6V Car Charger! Connect the DC-DC charger to the accessory plug of your car or boat and have your device ready to go when you need it most. ECTACO iTRAVLs, as well as 400 models, can be powered using this charger. It converts 12V into 6V and has a center positive connector. This combination power supply for P500/P850/P900 and iTRAVL devices contains of a DC power adapter. Use it as a primary or supplementary power source. For use with all P500/P850/P900 and iTRAVL models. Acquiring supplementary two years of warranty, you thus increase your warranty service period to three years. It is possible to purchase a supplementary two-year warranty that covers servicing of any model from the 850 series. Acquiring supplementary two years of warranty, you thus increase your warranty service period to three years. It is possible to purchase a supplementary two-year warranty that covers servicing of any model from the 900 series. Acquiring supplementary two years of warranty, you thus increase your warranty service period to three years. It is possible to purchase a supplementary two-year warranty that covers servicing of any model from the 500 series. Keep your iTRAVL up und running at all times with an extra battery pack. While one is charging, the other is helping you navigate and learn. Keep your iTRAVL charged and ready no matter where you are in the world with this international 110/240V charger that lets you connect to any outlet in the US, Asia Pacific, Europe and UK. This stylish headset with noise-cancelling microphone has been specially designed to improve device accuracy and reliability. It is comfortable, practical and lightweight and allows you to operate hands free in most environments, providing a superior translating experience that is hassle-free. Keep your iTRAVL looking like new with this protective film for your device's LCD screen. Prevent scratches that come with frequent use and contact with keys, coins and sunglasses. This belt-mounted loudspeaker attaches to the iTRAVL and provides crystal-clear pronunciation to keep your hands free while allowing your listeners to hear every word and phrase you want to say. Belt mounted loudspeaker cannot be used without Switch Box. Keep your ECTACO jetBook protected wherever you may go with this stylish and practical embossed leather travel wallet. With the appearance of a standard pocket diary, it offers a handy way to keep your jetBook safe and sound while providing a pen and paper for any notes you may want to make while reading. The ECTACO jetBook Leather Travel Wallet is compatible with all ECTACO jetBook devices. Keep your iTRAVL looking great and working like new while protecting it from the bumps and scratches of daily use with this stylish and practical tough silicone pouch. Replaces a lost stylus so you don't need to risk damaging the iTRAVL LCD screen with pens, pencils or other non-standard pointing devices.